For other people named John Cornwell, see John Cornwell (disambiguation). 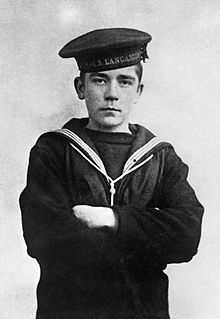 John Travers Cornwell VC (8 January 1900 – 2 June 1916), commonly known as Jack Cornwell or as Boy Cornwell, is remembered for his gallantry at the Battle of Jutland during World War One. Having died at the age of only 16, he was posthumously awarded the Victoria Cross, the highest award for gallantry in the face of the enemy that can be awarded to British and Commonwealth forces. Cornwell is the third-youngest recipient of the VC after Andrew Fitzgibbon and Thomas Flinn. John "Jack" Travers Cornwell was born as the third child of a working-class family at Clyde Place, Leyton, Essex (now in Greater London). His parents were Eli and Alice Cornwell. The family later moved to Alverstone Road, East Ham. He left Walton Road School at the standard age of 14, but was in the Boy Scouts. At the outbreak of the First World War, ex-soldier Eli Cornwell volunteered for service and was fighting in France under Lord Kitchener. His elder brother Arthur also served in an infantry regiment on the Western Front. In October 1915, Jack Cornwell gave up his job as a delivery boy and enlisted in the Royal Navy, without his father's permission. He had references from his headmaster and employer. He carried out his basic training at HMS Vivid Keyham Naval Barracks in Plymouth, and received further training as a Sight Setter or Gun Layer and became Boy Seaman First Class. On Easter Monday 1916, Cornwell left for Rosyth, Scotland to join his assignment in the navy. He was assigned to HMS Chester. 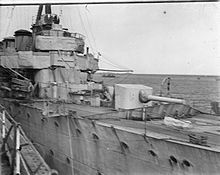 On 31 May 1916, Chester was scouting ahead of the 3rd Battlecruiser Squadron at the Battle of Jutland when the ship turned to investigate gunfire in the distance. At 17:30 hours, Chester soon came under intense fire from four Kaiserliche Marine cruisers each her own size which had suddenly emerged from the haze and increasing funnel smoke of the battlefield. The shielded 5.5-inch gun mounting where Cornwell was serving as a sight-setter was affected by at least four nearby hits. Chester's gun mountings were open-backed shields and did not reach down to the deck. Splinters were thus able to pass under them or enter the open back when shells exploded nearby or behind. All the gun's crew were killed or mortally injured except Cornwell, who, although severely wounded, managed to stand up again and remain at his post for more than 15 minutes, until Chester retired from the action with only one main gun still working. Chester had received a total of 18 hits, but partial hull armour meant that the interior of the ship suffered little serious damage and the ship itself was never in peril. Nevertheless, the situation on deck was dire. Many of the gun crews had lost lower limbs due to splinters passing under the gun shields. British ships reported passing the Chester to cheers from limbless wounded gun crew laid out on her deck and smoking cigarettes, only to hear that the same crewmen had died a few hours later from blood-loss and shock. "The instance of devotion to duty by Boy (1st Class) John Travers Cornwell who was mortally wounded early in the action, but nevertheless remained standing alone at a most exposed post, quietly awaiting orders till the end of the action, with the gun's crew dead and wounded around him. He was under 16½ years old. I regret that he has since died, but I recommend his case for special recognition in justice to his memory and as an acknowledgement of the high example set by him." 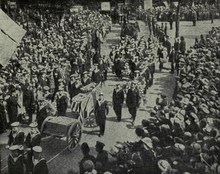 The funeral procession of John Travers Cornwell VC at Manor Park on 29 July 1916. In May 2016, the family grave and war memorial, erected in 1920, was given Grade II listed status, legally protecting it from unauthorised modification or removal. The KING has been graciously pleased to approve the grant of the Victoria Cross to Boy, First Class, John Travers Cornwell, O.N.J.42563 (died 2 June 1916), for the conspicuous act of bravery specified below. Mortally wounded early in the action, Boy, First Class, Jack Travers Cornwell remained standing alone at a most exposed post, quietly awaiting orders, until the end of the action, with the gun's crew dead and wounded all round him. His age was under sixteen and a half years. On 16 November 1916, Cornwell's mother received the Victoria Cross from King George V at Buckingham Palace. Court painter Frank O. Salisbury made a portrait of Cornwell, using his brother Ernest as a model, depicting him standing in his post. Boy Cornwell Memorial Fund was also established. After that, the rest of the family was effectively forgotten. After Eli Cornwell's death on 25 October 1916, his half-brother Arthur Frederick Cornwell was killed in action in France on 29 August 1918. The impoverished Alice Cornwell died at the age of 48 on 31 October 1919, at 745 Commercial Road in Stepney, in rooms she was forced to take when her son's memorial fund refused financial aid. The two of her children remaining at home were granted £60 a year in a pension from the fund after Alice's death, but this proved insufficient and they both emigrated to Canada in the early 1920s. Jack Cornwell's elder half-sister, also named Alice, loaned Jack's Victoria Cross to the Imperial War Museum on 27 November 1968. Salisbury's portrait of Cornwell hangs in the Anglican church within the Royal Navy's Initial Training Establishment HMS Raleigh, perhaps selected as an appropriate place also because the ship's Chaplain, The Rev. Cyril Ambrose Walton, was also killed during the action. The John Cornwell Victoria Cross National Memorial cottages in Hornchurch, for needy former sailors and marines. The original furore caused by his very public re-burial led to over seven million of the Empire's children donating to his fund. £18,000 was raised in his memory for the Jack Cornwell ward of the Royal Star and Garter Home, Richmond. The John Cornwell Victoria Cross National Memorial (JCVCNM) was established in 1928, when a plot of land was purchased at Hornchurch, then in Essex, with money raised by the Mayor of East Ham. There, a community of cottage homes was built for needy, disabled or infirm former sailors and Royal Marines, up to and including the rank of Warrant Officer and their families. The six semi-detached houses and pathways are laid out in the form of a Victoria Cross. Since 2008, the community has been under the trusteeship of The Royal Naval Benevolent Trust. The Cornwell Scout Badge may be awarded to members of many Commonwealth Scout associations for "pre-eminently high character and devotion to duty, together with great courage and endurance". Sir Robert Baden-Powell, the founder of the Scout movement, created an award in his honour, The Cornwell Scout Badge, which is still used by Scout associations throughout the Commonwealth. It is awarded to youth members in respect of pre-eminently high character and devotion to duty, together with great courage and endurance. Camp Cornwell, established in 1925 as the headquarters for Western Australian Sea Scouts is situated at Pelican Point on the Swan River near Perth. Jack Cornwell is also remembered by the Sea Cadet Corps, Army Cadet Force and Air Training Corps, who each have a unit based in the UK's first and only Tri-Service Cadet building, named The Cornwell VC Cadet Centre, on Vicarage Lane in East Ham. Newham (Cornwell VC) Sea Cadets have been honoured with 'J T Cornwell VC' on their cap ribbon (Cap Tally) instead of the customary TS (training ship). They are the only Sea Cadet Unit in the UK to have this honour. In 2003, the Cadets suggested commemorating him by renaming a school in Leyton after him; when Cornwell attended the school it was known as Farmer Road School, and it is now named George Mitchell School, after another former pupil, George Allan Mitchell, who won a VC in Italy during the Second World War. Jack Cornwell is also remembered by Royal Navy Combined Cadet Force divisions, such as the RN CCF section at Whitgift School, Croydon, which is named the "Cornwell" division in his honour. Cornwell's gun on display at the Imperial War Museum. In Canada, Royal Canadian Sea Cadet Corps John Travers Cornwell, VC, based on HMCS Chippawa in Winnipeg, MB is named after him. In Little Ilford, Jack Cornwell Street and a nearby block of council flats called John Cornwell VC House are named in his memory. In Jack Cornwell Street there is a public house named The Victoria Cross to commemorate his medal. A blue plaque has been erected by the London Borough of Waltham Forest on the flats that now occupy the site of his birthplace in Clyde Place, Leyton. The 5.5-inch gun on which he served is still displayed in the Imperial War Museum, London. In September 2006, Jack Cornwell VC featured on one of a series of Royal Mail postage stamps marking the 150th anniversary of the Victoria Cross. Cornwell Close, on Grimsby's Nunsthorpe Estate and Cornwell Court in Haslemere Road, Portsmouth are named after him. Citadel High School of Halifax, Nova Scotia gives out the Jack Cornwell Award to a student in each graduating class to the student who most exemplifies the qualities of honour, loyalty and bravery. Mount Cornwell (2,972 metres) is a peak in the High Rock Range in British Columbia, part of the Canadian Rockies, which was named in his honour in 1918. There is also a Mount Chester (3,054 metres) in Alberta, named after HMS Chester in 1917. ^ cwgc.org CWGC Debt of Honour Register. ^ Historic England. "Details from listed building database (1433403)". National Heritage List for England. Retrieved 4 August 2016. ^ "No. 29752". The London Gazette (Supplement). 15 September 1916. p. 9085. ^ "HMS Chester 1916 Jutland Casualty List". ^ Davenport-Hines, Richard (September 2004). "Oxford Dictionary of National Biography – Cornwell, John Travers (1900–1916)". www.oxforddnb.com. Oxford University Press. Retrieved 31 January 2014. ^ "Housing: John Cornwell Victoria Cross National Memorial". www.rnbt.org.uk. Royal Naval Benevolent Trust. Archived from the original on 10 February 2014. Retrieved 2 February 2014. ^ a b "Awards for Gallantry and Meritorious Conduct". ^ Weaver, P (17 May 2008). "Sea Scouts' Camp Cornwell – Western Australia". www.panoramio.com. Retrieved 31 January 2014. ^ Price, Colin (July 2012). "Victoria Cross, Manor Park, E12, London". The Lost Pubs Project. Retrieved 7 February 2014. ^ "Waltham Forest Heritage Plaques". www.walthamforest.gov.uk. London Borough of Waltham Forest. 23 January 2014. Archived from the original on 20 January 2014. Retrieved 2 February 2014. ^ Imperial War Museum. "Naval BL 5.5 in Mk I Gun with Mk I pedestal mount". Imperial War Museum Collections Search. Retrieved 24 February 2012. ^ "GB New Stamps and Special Postmarks – 150th Anniversary of the Victoria Cross – 21 September 2006". www.norvic-philatelics.co.uk. Norvic Philatelics. 11 September 2006. Retrieved 2 February 2014. Wikimedia Commons has media related to Jack Cornwell VC. A 'Scouting Milestones' history of Jack Cornwell written from the Scouting perspective and containing much original material, including a fully documented account of Jack Cornwell's first burial in the 'common grave' at the Wayback Machine (archived 14 August 2007). This page was last edited on 12 April 2019, at 18:55 (UTC).